President Barack Obama enters his coming budget battle with the Republican-led Congress in a climate of American public opinion that is surprisingly positive. A growing number of Americans see signs of economic recovery, and the president’s approval ratings have increased accordingly in most national polls. At the same time, trends in public opinion are in line with Obama’s agenda: The priority given to deficit reduction has slipped somewhat, while public support for rebuilding the nation’s infrastructure has increased. The president’s policies addressing income inequality generally meet with strong conceptual approval: The public heartily endorses efforts to improve the lot of poor people. At the same time, when it comes to income inequality, the public’s reaction to a populist approach may well be more mixed. While the public acknowledges the problem, there is less of a consensus about whether the government should take strong measures to reduce the gap between the wealthy and other Americans. It’s a highly partisan and potentially divisive issue. Nonetheless, there is every indication that the public not only sees the problem of inequality, but is finding it more difficult to get ahead. The number of Americans who believe there is plenty of opportunity to get ahead through hard work has declined by 16 percentage points since the turn of the century, according to Gallup. 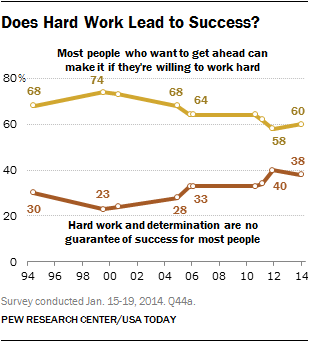 Pew Research Center surveys also find a significant decline over this period in the share of Americans thinking that hard work leads to success. Indeed, the economic data show, it’s no longer just a growing gap between rich and the poor, but also one in which the middle class is being outpaced by the wealthy. The public sees this as well. For decades, Pew Research Center surveys have found large majorities saying that “it’s really true that the rich get richer while the poor get poorer.” Roughly three-quarters of Americans (76%) agreed with this statement in 2012. But in that survey, an identical percentage said that the gap in living standards between the middle class and rich had widened over the previous decade. When it comes to solutions, the polls find a very broad consensus in support of policies aimed at helping poor people. A January 2014 poll by the Pew Research Center and USA TODAY found that fully 73% of its respondents favored increasing the minimum wage to $10.10 an hour, and 63% backed a one-year extension of benefits for the long-term unemployed. But views were more equivocal when it came to the gap between the rich and everyone else. While a 53% majority in this same poll favored the government doing a lot to reduce poverty, just 43% said the government should do a lot to reduce the gap between rich people and everyone else. Similarly, a June 2014 Bloomberg national poll – which showed 67% believing the gap between the rich and everyone else is getting bigger – found respondents divided as to whether it would be better for the government to implement policies that would shrink the gap (44%), or better for the government to let the market operate freely, even if the gap gets wider (47%). In effect, Americans tend to agree that inequality is a problem, but are divided over what to do about it. This is because partisanship drives opinions about approaches. Democrats support a great deal of government action against both poverty and broader inequality. However, Republicans make a distinction between the two problems. 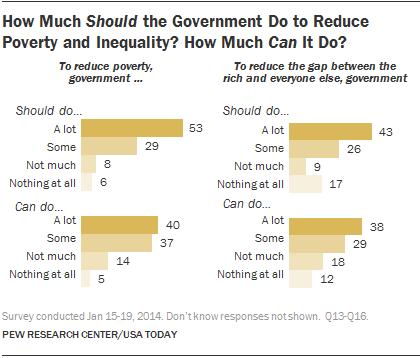 According to the Pew Research/USA TODAY poll, a 64% majority support at least some government action in reducing poverty, but only 45% of Republicans favor government action on reducing the gap between the rich and everyone else. The views of independents are mixed; most favor a “lot” of government action to reduce poverty (56%), but just 42% are as supportive of the government taking steps to reduce the gap between the rich and everyone else. These numbers reflect the conflict between the public’s thinking about the seriousness of a growing economic divide and its belief in free enterprise. Pew Research surveys over the past decade have consistently found wide majorities expressing the view that most people are better off in a free-market economy, even if it means that some are rich and some are poor. While the Democrats have long been seen as the party most concerned with helping the poor, and the Republicans the rich, the Democrats hold only a modest advantage in being seen as the party that is best for the middle class. In a Washington Post/ABC News poll last month, Obama’s margin over the GOP was narrow when it came to who the public believed had better ideas for helping the middle class: 45% chose Obama, compared with 37% who favored the GOP. All things considered, the growing income divide between the rich and the rest of the country is much on Americans’ minds, but public receptivity to solutions will not be a simple matter. Proposed policy changes will be judged not only on their likely effectiveness, but on fairness and in their keeping with American values. And those values are, at times, contradictory.